Albums | Bringing It All Together With MOH!! What is the difference in wedding albums offered? Very good question. It is important to find out exactly what your photographer is offering when it comes to packages. I have heard many horror stories of professional photographers having to create and fix albums for brides because their photographer did and awful job. Tammie Sybelnik of The Wedding & Portrait Photographers in Jacksonville, Florida shared her story with us and some tips on how to avoid a disaster. .
One afternoon I had the opportunity to meet some wonderful ladies. They were the bride’s event planner, her mother and her aunt. They came in to take a closer look at my work hanging on the wall. They stated the bride already had signed a contract for a wedding photographer but wanted to know if I did boudoir sessions. I told them yes and to have the bride call me and we would put her on our schedule. “Sara” (the name has been changed) came to our studio and did a “special session” for her fiance’. 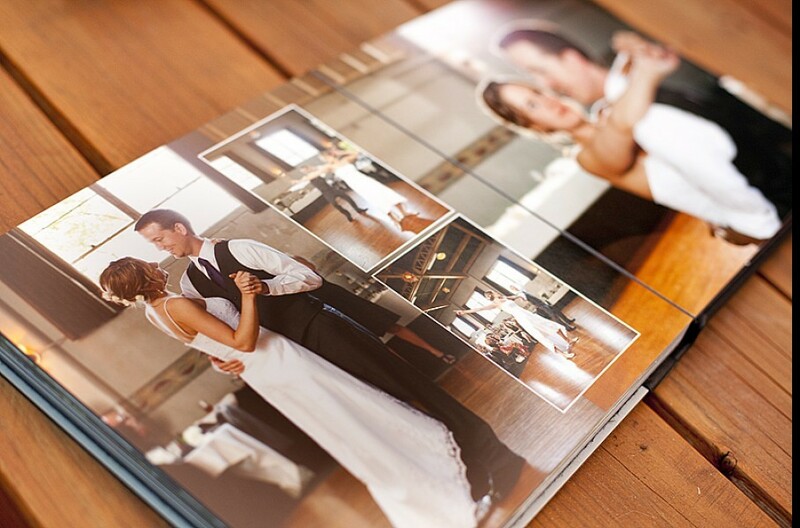 She ordered a flush mount album to present to her future husband on their wedding day. Needless to say she was extremely pleased with both her session and her album. I kept in contact with Sarah as she hired my florist friend for her wedding. We would briefly chat about how her wedding plans were coming and life in general. About 6 weeks ago (after her wedding) I received an email from Sara. In it she stated she had just received her wedding “album” from her photographer and it was AWFUL. She wanted to know, since the photographer has given her a copyright release to her images, if I could design an album for her. I made an appointment for her along with instructions to bring the CD of images and her current “album”. I could not believe what she brought in. Her “album” was a coffee table style book made from a company similar to Shutterfly or Snapfish. There was no flow to the album and it did not tell the story of her wedding day. The “album” even came complete with a barcode on the back. Sara thought she was going to receive something like what she had purchased from me. A leather bound flush mount album that you could pass down from generation to generation. What she had received was a “hot mess”. Now I am not writing this to bash the other photographer. If that type of book was included in her package that is fine. But it should have been explained to Sara exactly what she would be receiving. Upon redesigning her album I found that the photographer had made some very rookie mistakes. There were no room detail shots, no first dance images, and the only image of the father-daughter dance was out of focus to name a few things. My heart broke for Sara because I know her wedding photography was very important to her. We did redesign her album the best we could and she was absolutely THRILLED!! looking at the straight from camera work make sure the image is properly exposed. want to be able to see that. Your dress SHOULD NOT BE a glowing hot with mess! 2) Ask to see a sample of all products given to ensure that there are not misunderstandings. 3) Ask if the photos you receive are edited and to what extent. 4) Ask how many photos on average can you expect. Make sure everything is in writing BEFORE you sign the contract. And most importantly, make sure you like the photographer’s personality. If you do not like them (and people do hire people they do not “click with”) it will show in you photos. I hope that Sara’s unfortunate experience can prevent someone else from going through the same thing. Or better yet, pick up the phone and call us. We understand the importance of your wedding day and will go the extra mile to ensure your story is told.